The Siberian moth (Dendrolimus sibiricus) (SM) defoliates several tree species from the genera Larix, Picea and Abies in northern Asia, east of the Urals. The SM is a potential invasive forest pest in Europe because Europe has several suitable host species and climatic conditions of central and northern Europe are favourable for the SM. This study developed a grid-based spatio-temporal model for simulating the spread of the SM in case it enters Europe from Russia via border stations. The spread rate was modeled as a function of the spatial distribution of host species, climatic suitability of different locations for the SM, human population density, transportation of moth-carrying material, and flying of moths from tree to tree. The simulations showed that the SM is most likely to spread in the forests of northeast Belarus, the Baltic countries, and southern and central Finland. Climatic conditions affected the occurrence of the SM more than human population density and the coverage of suitable host species. Many non-native invasive pests and pathogens are threatening the forest ecosystems of Europe. Global trade and climate change may increase the risk of invasions in the future. One potential new pest is the Siberian moth (Dendrolimus sibiricus). The Siberian moth (SM) is a severe defoliator of conifers in northern Asia, east of Ural (Baranchikov et al. ). Damaged areas total over ten million hectares, causing forest death in half of this region (Rozhkov ). Recent records suggest that the SM spreads about 50 km per year westwards. Some adult males have already been found near Moscow (EPPO ). The SM is a potentially dangerous invasive pest because many European conifer species from the genera Larix, Abies, Picea and Pseudotsuga are susceptible to it. Two-needle Pinus species are poor hosts for the SM due to low larval survival and growth rate with a result that very few moths can complete their development in 2-needle pines (Kirichenko et al. , ). Therefore, the SM usually avoids Pinus sylvestris stands when more favorable food is available (Rozhkov ). The climate is suitable for the SM in large areas of Europe (Anon [2012;] Flament et al. ). Recently, the SM has been recommended to be a quarantine pest in the member countries of European and Mediterranean Plant Protection Organization (EPPO ). Adult SMs are yellowish-brown or light grey to dark brown or almost black. Females are approximately 40 mm long and males are 30 mm long (EPPO ). The moths fly and lay eggs from the end of June to the beginning of August (Baranchikov et al. ). One female lies on average 200–300 eggs on needles, with a maximum of 800 eggs (EPPO ). Egg development takes about two weeks. The hairy larvae are 50–80 mm long and they overwinter under forest litter. At the end of April, larvae return to the crowns feeding intensively. The life cycle takes 1–3 years, usually 2 years, and an outbreak lasts for 2–3 years (Rozhkov ; Baranchikov et al. ; EPPO ). Tree mortality is high because wood borers and bark beetles attack the weakened trees, and dead forests are predisposed to forest fires (EPPO ). The SM has numerous natural enemies including egg, pupal and larval parasitoids, bacteria, viruses, fungi and insects (Orlinski ). As many as 10%–60% of eggs, 10%–99% of larvae and 70% of pupae are killed, the highest values pertaining to the end of outbreaks (Boldaruev ; EPPO ). Aerial treatments with chemical and bacterial products have been used during outbreaks in Russia (EPPO ). The spread of the SM to new areas is possible by transportation of eggs or larvae in forest products and timber or nursery stock (EPPO ). The moths are also strong flyers and may fly up to 100 km per year (Rozhkov ). To prevent the introduction of the moth, it is recommended that plants and branches should be free from soil, originate from a pest-free area or be fumigated or be imported during winter. Wood should be debarked, heat-treated, originate from pest-free area or be imported during winter (EPPO ). Quantification of the potential threat by the SM would benefit from model-based risk analyses. 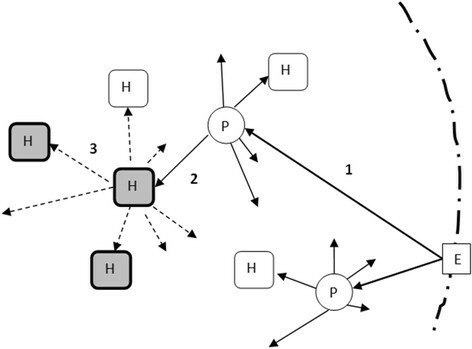 Models that describe the spread of the pest as a function of controllable variables such as the number of arrivals in imported materials, as well as the density and spatial distribution of host species, would make it possible to compare the efficiency of alternative prevention and eradication strategies. The aim of this study was to construct a grid-based spread model to predict the regions that are likely to be the most susceptible to the SM in Europe (excluding Russia). The spread of the pest from the access points was predicted from the climatic suitability of different localities to the SM, flight capacity of the moth, and the geographical distribution of suitable host trees. We focused on relatively immediate threats to Europe, the next 20 years only. The effect of climate change on the spread of the SM was incorporated in the model, which is important in longer-term simulations. The model was used to calculate a probability map for the spread of the SM on the assumption that it enters the non-Russian parts of Europe in infected wooden materials imported through border stations between Russia and other European countries. The developed spatio-temporal spread model is a mechanistic grid-based model resembling a cellular automaton. The input grids (raster maps) of the model are 1) occurrence of host species, i.e., Larix, Abies, Picea and Pseudotsuga (Figure 1), 2) ecoclimatic index of the SM, and 3) human population density. The raster of host species was obtained by combining the species-specific maps developed by the European Forest Institute (Tröltzsch et al. ). These maps indicate the coverage of each species in a 1 km by 1 km grid. Overlaying all the host species maps resulted in a raster of the total percent coverage of all host species of the SM (Figure 1). The cell size, coverage and a maximum number of mature host trees per hectare (500 in this study) were used to calculate the number of host trees in each cell. Figure 1 shows that the distribution of host species has some gaps that coincide with national borders. Most probably these gaps are consequences of varying data availability from different countries when the cover maps were developed. Fortunately, the gaps are in regions to which the SM is not likely to spread. 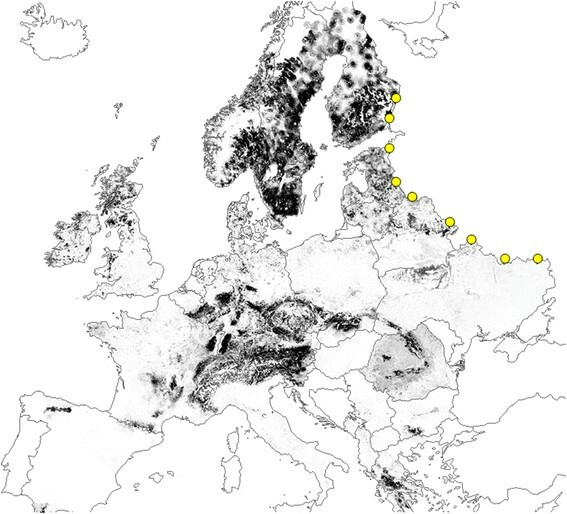 Raster map of the total coverage of the host species of the Siberian moth ( Larix , Abies , Picea and Pseudotsuga ) in Europe (Tröltzsch et al.). The access points used in this study are shown with circles. Another input of the simulation model is a list of access points (Figure 1). The following information is required for each access point: 1) coordinates, 2) first and last year of arrivals, and 3) number of arrivals per year. An arrival refers to a cargo with SM-carrying material in border stations between Russia and other European countries. The climatic suitability map for the SM was developed using the process-oriented climatic niche model CLIMEX. In this model, suitability is described with the ecoclimatic index (EI), which describes the climatic suitability of a location for the species on scale 0 (unsuitable) – 100 (optimal) (Sutherst et al. ). The EI is a combination of annual growth indices (population growth rate as a function of soil moisture and temperature) and stress indices (cold, wet, hot, dry, cold-wet, cold-dry, hot-wet, and hot-dry stress). CLIMEX has also a mechanism for defining the minimum number of degree-days during the growing season that are needed for population development. The CLIMEX models are fitted to known distribution data by a manual iterative process: the growth and stress parameters are changed and the model results are compared with the known geographical range of the species until a good agreement is found (Sutherst et al. ). CLIMEX parameter values affecting the species’ response to temperature may be determined also by laboratory experiments (Desprez-Loustau et al. ). In this study, the values of growth and stress indices and the minimum temperature sum (degree-days) for the SM were obtained from Flament et al. (). The CLIMEX model was used to produce EI maps for SM in Europe for the past climate (1961–1990) and that in 2071–2100 according to the climate scenario A1B. The A1B scenario describes medium-to-high greenhouse gas emissions and leads to moderate estimates of global average temperature change of around 3.4°C by year 2100 (IPCC ). The climate change parameters for temperature and rainfall were determined separately for southern and northern Europe (Christensen et al. ) (Table 1). 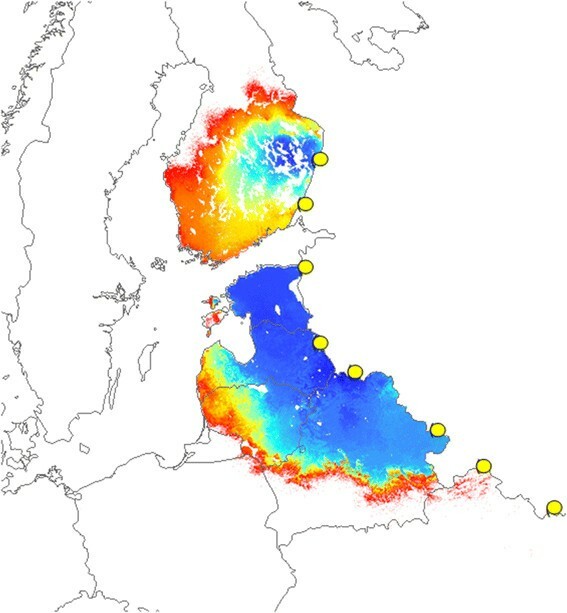 The map of the current ecoclimatic index (Figure 2) produced with the CLIMEX model showed that the area currently suitable for Siberian moth covers large areas in central and northern Europe. In the future, the suitable area for the SM moves slowly north-eastwards due to the climate change. For example, most of Great Britain, Spain and Italy become unsuitable, whereas the susceptibility of eastern and northern Europe increases. Ecoclimatic indices of the Siberian moth in the current climate. Dark colour represents high climatic suitability. The two EI maps were used as inputs for the spread model. The EI of a particular simulation year was obtained as the weighted average of the EI rasters for two climates (1961–1990, 2071–2100). In this way, the effect of climate change was automatically included in the simulations. The model developed for the spread of the SM assumes that the moth reaches new areas via access points such as harbours and border stations (Figure 3). Wood materials that contain adult SMs are imported to the region through these points. The locations, as well as the annual number, first year and last year of arrivals are specified for each access point. The maximum transportation distance of imported material and the number of moths emerging from each transported object are additional model parameters. The imported infected objects are distributed as follows. The direction of the transportation is a uniform random number distributed between 0 and 360 degrees, and the distance of transportation is a random number uniformly distributed between zero and a specified maximum transportation distance (200 km used in this study). The two random numbers produce a candidate destination, which is accepted with the probability proportional to human population density, i.e., objects are transported to places where people are living. If the destination is rejected, another candidate destination is produced, until an accepted destination has been found for the infected object. Spread mechanisms of the Siberian moth. 1) Moth-carrying wooden materials are transported from border stations (E) to places where human population density is high (P). 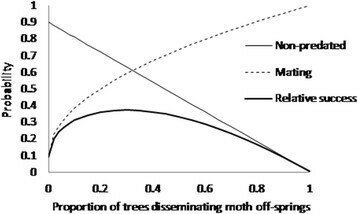 2) Adult moths seek suitable host trees and some of them find one (H). 3) Some of these insects mate and produce off-spring (shaded host trees), which spread to host trees in surrounding locations. where EI is the ecoclimatic index of the cell, NHealthy is the number of healthy host trees within the destination cell and NMax is the maximum possible number of host trees in a cell (500 trees/ha times cell size, 100 ha) and f (EI) is a function that defines how the acceptance of a location is related to the ecoclimatic index (Figure 4). If the cell is not accepted, another destination is generated for the same insect. The insect has a certain number of tries to find a suitable host tree (10 tries in this study). Repeated generation of flight destinations simulates the active behaviour of the moth when it searches for suitable host trees. Relationship between ecoclimatic index ( EI ) and the probability of accepting a location f ( EI ). The probability that that the insect lays eggs and makes one tree capable of spreading off-spring is calculated from. where pMatingLow is the probability of mating in a new region (at low population density) and NSpreading is the number of trees within the cell that are disseminating moth off-spring. The ratio NSpreading/NMax describes the relative density of the moth population; the higher the density, the higher is the probability to find a mate and lay eggs (Figure 5). The value used for pMatingLow was 0.1 except when studying the sensitivity of the model to this parameter. Reproduction success of the Siberian moth. 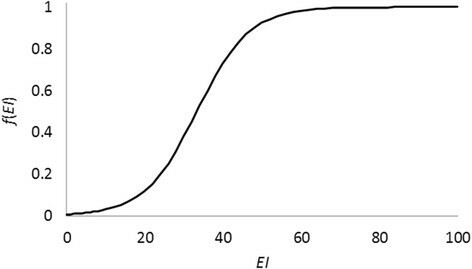 Probability of a moth to mate (Mating) and probability that an egg, larva or pupa is not parasitized or predated (Non-predated) as a function of relative moth population density (proportion of trees disseminating off-spring of the maximum number of host trees in the cell). The thick line shows the combined effect on mating success, parasitization and predation on the relative number of off-spring produced by a moth. Female moths that have mated and found a suitable host tree lay eggs, which develop into larvae and pupae. Many eggs, larvae and pupae are parasitized and predated so that only a small proportion of them become adults. The proportion of adults decreases with increasing moth population density (Figure 5). As a result of the combined effect of mating success, parasitization and predation, the rate of off-spring production is the highest with medium moth population densities (Figure 5). An infected tree continues to disseminate new moth generations for a certain number of years (2 years in this study), after which it dies. Since the number of eggs that a moth lays is known, it would be possible to simulate the spread of the off-spring similarly to the spread from imported wooden materials. However, since this approach was found to be computationally too demanding for simulations comprising several countries, another approach based on the relative off-spring density was developed. In this approach, the off-spring density within a donor cell is calculated from. where pNotPredated is the proportion of eggs that become adults (not parasitized or predated during the different stages of development). The probability of escaping parasites and predators is calculated from (Figure 5). where pPredatedLow and pPredatedHigh are, respectively, the probability of being parasitized or predated at very low (zero) and very high population density. The following values were used in the baseline simulations of this study: pPredatedLow = 0.1, pPredatedHigh = 0.995.
where NHealthy is the number of healthy host trees in the recipient cell. NNewSpreadingTrees is seldom an integer number. If it is for instance 5.7, five healthy trees become capable of spreading (with certainty) and the sixth tree becomes capable of spreading with a probability of 0.7. In every simulation year, the influence area of every cell disseminating moths is analyzed. After disseminating new moth generations for a certain number of years (2 years in this study), the tree is classified as dead. Mean flying distance of the moth: 11 km. Maximum flying distance of the moth: 50 km. Number of female moths per imported object: 10. Number of years that an infected tree spreads off-spring: 2. Number of tries the moth has to find a suitable host tree: 10. Maximum number of full-sized trees of host species per hectare: 500. Probability of mating in a new region (with very low population density): 0.1. Proportion of parasitized/predated eggs/larvae/pupae at low population density: 0.1. Proportion of parasitized/predated eggs/larvae/pupae at high population density: 0.995. The simulation period was always 20 years and the access points (Figure 1) were the same in every simulation. One hundred simulations were done in the baseline simulation for producing the map of the probability of spread. The sensitivity analyses were based on 10 simulations with each combination of parameter values. According to 100 20-year simulations with the baseline parameters given above, the probability of spread from the nine import stations along the western border of Russia was the highest for Belarus and the Baltic countries (Figure 6). There was less spreading in Finland, and almost no spreading from the southernmost access points in Ukraine. The average proportion of the area that was infested in 20 years was about 5% of the forests having suitable host trees. The results of repeated simulations varied a lot due to the stochastic components of the model (Figure 7). Infection probability map of the Siberian moth. Probability that the Siberian moth spreads to different locations from border stations between Russia and non-Russian European countries when there are 5 arrivals per year from each station and the arrivals last for 3 years. Blue = 70%–90%, turquoise = 50%–60%, yellow = 30%–40%, red = <10%. Temporal development of the spread in four repeated 20-year simulations. Dark tone indicates early infestation (mostly within 3–5 years) and light tone is recent infestation (mostly in the last simulation year, i.e., 20 years since the beginning). The results suggest that the spread is mainly dictated by the ecoclimatic index and the coverage of host species within areas that are climatically suitable for the SM. Human population density seems to be less important although the spread of imported moths to forests always begins from populated locations. Sensitivity analyses revealed that the model output, i.e. 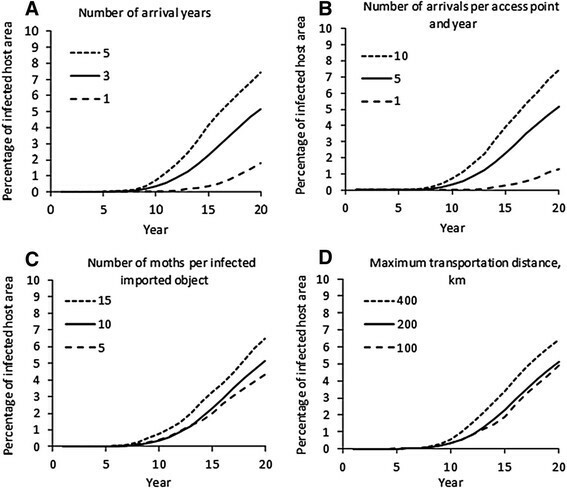 the percentage of infected area, out of the total area of host species, was rather sensitive to changes in the number of arrival years and number of arrivals per year (imported moth-carrying objects) (Figure 8A,B). However, the effect of the number of arrivals was non-linear suggesting that each new arrival has a smaller and smaller influence on the total area infected (Figure 8B). The model was less sensitive to the number of moths per imported object (Figure 8C). The highest infection area was obtained with the maximum transportation distance of 400 km (Figure 8D). The transportation distance may not affect much the percentage of infected host area, but it may have an effect on the spatial distribution of the infected cells. Sensitivity of infected area to controllable model parameters. Solid line represents the baseline parameter values. Of the biological parameters, the model was very sensitive to changes in the mean and maximum flight distance of the moths (Figure 9A). Probability of mating of the moth in a new area affected very much the extent of infected area (Figure 9B), at least for the first 20 years of the spread. The model was sensitive to changes in the parasitization and predation rate at low population density (Figure 9C), but rather insensitive to changes in the parasitization and predation rate at high population density (Figure 9D). Sensitivity of infected area to un-controllable model parameters. Solid line represents the baseline parameter values. The spread model developed in this study describes a phenomenon, which does not exist yet in Europe. The purpose of the model is risk evaluation, not forecasting the exact route and timing of the spread. Since the model is highly stochastic, single runs with the model do not prove that the model is correct or incorrect. All these facts make the validation of the model difficult. However, spread models for species that already exist in Europe have shown that grid-based models can predict spread rates similar to the realized rate (Pukkala et al. ). The spatial distribution of host species and the ecoclimatic index determine the regions where the SM can spread. Therefore, despite the difficulty to calibrate and validate the model with empirical measurements, the maximum potential area at risk can be calculated more reliably. The sensitivity analyses showed that the model is very sensitive to several biological parameters, especially to the mating success of the moth at low population density and the distribution of flight distances. These parameters had a dramatic influence on the infected area in a 20-year simulation, suggesting that these parameters must be known with high accuracy for reliable simulations. Even though some male hosts have been found to fly long distances near Moscow (EPPO ), the outbreaks will not begin without mating. It is realistic to assume that in new areas and with long flying distances, it is difficult for the moth to find a mating partner. Mating and flight distance parameters are mainly related to the early rate of the spread in a new region rather than to the eventual extent of infected area. Therefore, their influence on the total infested area would be smaller in more long-term simulations. The rate of the spread also depends on the duration, location and number of arrivals. These parameters are controllable, which means that they have no “correct” and “incorrect” values. Importing of moth-carrying objects can be controlled by restrictions of imported wooden and plant materials. A low number of access years (3 years) was used because it was assumed that all import of risky materials would be stopped within three years after the detection of the SM in European forests. The model is moderately sensitive to the parasitization and predation rate at low population density. There is some empirical knowledge on the parasitization and predation rates of eggs and other stages of development. At the general level it is known that, at high population density, parasites, predators, viruses and other enemies destroy almost all off-spring before they reach adulthood. This overall pattern was incorporated in the model. The used parasitization and predation rate at low population density is based on the assumption that 10% of eggs and 10% of larvae are parasitized or predated at low population density (Boldaruev , EPPO ) and 10% of larvae are killed because of poor nutrition (Kirichenko et al. ). The spread model predicts a total loss of 30% when the relative population density (NSpreading/NMax) is 0.2. The predicted extent of the infested area was not equally sensitive to changes in parasitization and predation rate at high population density. The used value (0.995) was based on the assumption that about 60% of eggs, 95% of larvae and 70% of pupae are killed (Boldaruev ; EPPO ). The way in which parasitization and predation rates change as a function of moth population density may affect the cessation of outbreak at a given location. In the absence of better information, this study assumed a linear increase in predation and parasitization rate (Figure 5). Because of parasitization and predation, the SM outbreak often lasts only a few years (Rozhkov ; Baranchikov et al. ; EPPO ). Therefore, to properly simulate the spread dynamics of the SM, the model should predict a cessation of the outbreak after a few years since the start. This model property can be visualized by showing the number of trees that are disseminating moth off-spring in a particular year. In the example simulation shown in Figure 10, the inner parts of Northeast Belarus are infested in simulation years 5–7, and there are no trees capable of spreading the SM in these regions by the end of the simulation, i.e., the outbreak is over. Figure 10 (right) shows that the outbreak progresses as a front. In the example simulation, one front spreads westward and another northward. The northern front would most probably stop at the sea coast. Results of a 20-year simulation. Left: Infection year (dark tone = early, light tone = late). Right: Number of trees capable of spreading the moth in the last simulation year (dark tone = 50–100 trees/ha, light tone = 1–2 trees/ha). The aim of this study was to develop a model that simulates the spread in a mechanistic way, i.e., mimics the various sub-processes of the spread in the same way as they happen in reality. This should guarantee reliable simulations once some measurable key parameters of each sub-process are known. However, the aim of achieving a mechanistic model was not fully met since the spread of moths from infected cells was simulated using relative off-spring density, because simulating the flights of individual off-springs was found to be computationally infeasible. This simplification does not affect the extent of the spread from an infected cell, but it may have an effect on the number of new infections around an infected cells. Most of the timber imported from Russia to Europe originates from west of the Urals, where the SM is not yet present. Coniferous timber from Siberia is mostly larch and Siberian pine, which are imported without bark or as sawn wood. The adult moths fly in July and live for about three weeks, and it is theoretically possible that they could be carried in timber to Europe (EPPO ). The egg stage lasts usually for two to three weeks in July-August, and eggs may be laid on bark during the outbreaks. However, it is unlikely that SM eggs are found in sawn timber. The larvae need foliage for food to survive during the transportation. The pupal stage lasts for about three weeks at the end of next June, and the cocoons are usually placed on branches. In addition, majority of the timber is harvested in winter when the SM is overwintering at the larval stage in forest litter. According to the phytosanitary regulations recommended by OEPP/EPPO (), imported wood should be debarked or heat-treated, or it should originate from a pest-free area or be imported during winter. Since the entrance of the SM to Europe in timber and wood products is easy to control, it is unlikely that SM could spread to Europe as a result of timber trade. However, all stages of the life cycle of SM can be transported in seedlings and other planting stock, branches, and Christmas trees (Orlinski ). According to the regulations recommended by OEPP/EPPO (), such materials should be free from soil, come from pest-free areas, be produced in protected buildings or fumigated, or be imported during winter. However, import of plants for planting or cut branches from Siberia to Europe is probably rare. In the case that the SM is imported from Russia to Europe, the predicted area infested during 20 years was the greatest in Belarus and the Baltic countries. Finland had a more limited area with high risk of infection, and in Ukraine the spread was minimal. It seems that high coverage of host trees, especially Norway spruce, does not make Finland exceptionally susceptible for the SM. The current and future ecoclimatic indices for the SM are lower in Finland than in the Baltic countries or Belarus, which suggests that climatic conditions play an important role in the spread of the SM. The human population density map was used as an input variable because transportations of wooden and plant materials were assumed to most probably end in densely populated areas. However, although infestations started from human-populated places, it was not easy to visually discern the effect of population density on the probability of infection by the SM. The simulated spread rate of the SM was around 20 km/year during 20 years. This is lower than the westward spread of SM in Siberia, 50 km/year (EPPO ), partly because the simulated initial spread rate in a new region is very low. At the end of the 20-year simulation period the spread rate was already close to 50 km/year. The somewhat slower spread rate in Europe may be a realistic result since the most suitable host species for the SM, Larix spp. are less common in Europe than in Siberia. In less favourable European host species, such as Picea abies, Pseudotsuga menziesii, Abies spp. and especially 2-needle Pinus spp., the larval survival and growth rate are lower than in Larix spp. (Kirichenko et al. , Kirichenko et al. ). Although the probability of arrival of the Siberian moth to Europe is low, the consequences of an invasion would be severe. The SM is able to spread rapidly to Belarus and the Baltic countries, and with a smaller probability to South and Central Finland. Since outbreaks are difficult to stop, the best strategy against the Siberian moth is a strict border control of imported wood, other parts of trees, and forest soil and litter. Dr. TM is project researcher at the University of Eastern Finland, Faculty of Science and Forestry. TP is professor of forest planning at the same institution. This study was made within the EU-funded project ISEFOR (Increasing Sustainability of European Forests: modelling for security against invasive pests and pathogens under climate change). We would like to thank Dr. Natalia Kirichenko, Dr. Dmitri Musolin and Dr. Julie Flament for valuable assistance. TM collected the biological information on the Siberian moth from published literature. TP developed the simulation software. Both authors conducted simulations and participated in the writing of the manuscript. Both authors read and approved the manuscript.